PRO-FX Long Wearing UV Top Coat is a glossy, non-yellowing clear coating that helps accelerate the drying time of nail enamel while also providing sun UV ray protection for your manicure. It provides a hard and chip-resistant coating that helps extend the wear of your manicure. 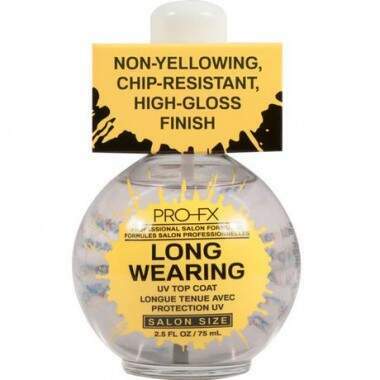 The formula is developed with a combination of UV absorbers to help protect the nail color from ultraviolet radiation. This helps to keep the color of your manicure true.